Beauty and cosmetics are as ancient as mankind. Women were and still are obsessed with looking beautiful with natural cosmetics products. 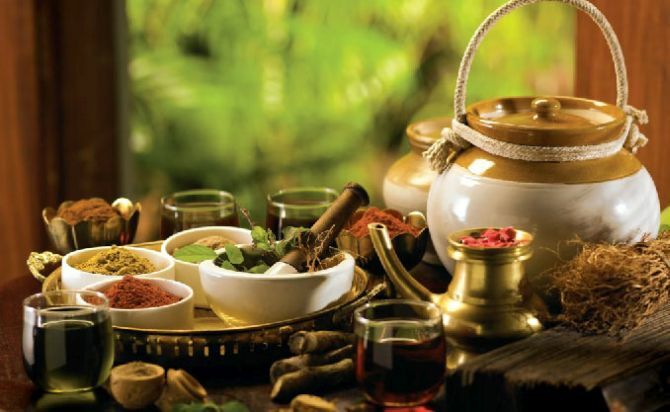 Indian herbs are significantly popular across the globe for providing and maintaining beautiful skin and hair by using product formulations that use natural ingredients only. Herbal cosmetics are an invaluable gift of nature with its demand growing considerably. Go Green!! Growth of the cosmetic industry is driven by products that use natural and herbal ingredients in its preparation. A large number of people across the globe are turning to natural and herbal cosmetics for skin and hair care. The skin care industry is expected to see a growth of more than 35%, which makes it the fastest growing industry in the world. India is the birthplace of herbal skin and hair care products. Natural, herbal formulations have attracted lots of attention as there are no known side effects of the use of these natural cosmetics unless someone is allergic to that particular ingredient itself. The chemical cosmetics are proved to be carcinogenic which has deterred most of the users and a grand shift is observed toward natural, herbal cosmetics. Skin and hair are constantly exposed to pollutants that harm the skin and hair. The chemicals, haphazard life style, stress, poor eating habits take a toll on the skin and hair. Over exposure to the sun also cause the skin to lose its luster and get tanned or freckled. Using chemical cosmetics further harms the skin and may cause cancer in some cases. The best option for healthy skin and hair is the use of natural cosmetics. Natural cosmetics are beauty products that are made from natural ingredients like plants, fruits, spices, herbs and natural oils. The ancient textbook of Ayurveda - the science of life has all the recipes for healthy skin, hair and a disease free body. The textbook today is studied by a group of scientists who continually research and develop new products based on these formulations to suit the need of today's woman. Every cosmetic product that is manufactured uses natural plant material. Health has become a top priority across the globe. A healthy way of living, regular exercise and care of the skin and hair in the natural way is becoming the norm. With a hectic, stressful lifestyle, the spa culture has caught up. The spas offer natural, holistic healing by therapeutic massage that uses all natural ingredients and aromatic oils. These not only soothe the body, but the mind as well. Natural scrubs that use different types of muds as per the skin type are prescribed to cleanse and polish the skin. With higher disposable income, a spa holiday is considered a well deserved holiday. Spa destinations are mushrooming across the globe and attracting clients to come and enjoy a holiday that includes some outdoor adventure, a beautiful property that offers serene environment, a whole package of body massages and de-stressing tools at most affordable rates. The harsh chemicals used in cosmetics adversely affect the skin, hair and the overall health of the user. The consumer is aware of this and prefers to use cosmetics that are made from natural ingredients. The demand for natural, herbal cosmetics has increased manifold. Most of the cosmetic manufacturers are shifting the line of business to natural cosmetics that include a range of skin care products like sunscreens, skin toners, anti-wrinkle creams, cleansers, body scrubs, face wash, moisturizers, lip balms, massage oils, bath and shower gels, acne packs, foot creams, hair oils, hair massage balms and all that one can think of to beautify the skin and hair. All these cosmetics that are truly herbal do not have any known side effect which has made them highly popular. Get the glow the natural way-use ayurvedic cosmetics is the success mantra. It is not possible for every manufacturer to shift to manufacturing such a wide range of natural cosmetic to suit the different buyer segments. The best option available is private label manufacturers. Leading private label manufacturers have a wide range of hair and skin care formulations that are developed by a team of experts at their facility. All the formulation is tested and altered as per the natural plant material available today. The formulations are designed for optimal effect of the combination of the ingredients used. You can grow as fast as the demand for natural cosmetics is growing.